It may come as a surprise, but many businesses are successfully using Instagram to build trust and gain customers’ affection, and, surely, make their profit graph go up (similarly to those businesses that enefit from using Pinterest). However, if everything that comes up to your mind is posting your product images with strong calls to actions in your Instagram account, you’re very far from being right. To show how Instagram can work to your business benefit, we need to explain the essence of this service. Instagram is all about images, this much you surely know. The great feature of this tool is that it actually presents a short path to your customers’ phones, since Instagram is created for mobile devices, and is virtually useless for PCs. So, why not utilize it to get a surge of “mobile” visitors to your store? It sounds especially tempting taking into account the numbers - Instagram has over 300, 000 000 monthly users, leaving the giant like Twitter behind. However, getting a lot of followers doesn’t always mean an increase in sales, so don’t expect a wave of traffic after you make your first post. Instagram users don’t expect you to sell something to them, but rather make them think or entertain. Moreover, your profile can have just one clickable link, so think twice before pasting your catalogue link in there. What’s the whole point, then - is this the question you’re now asking? Well, the point is, before plunging into Instagram depths you have to work out a wise strategy on how to reach your goals in the shortest possible time. Otherwise, it may turn into a race for new followers without any visible changes in your business progress. Instagram: how to gain new followers for your store account? 1. Set clear goals. It is best to set the goals that can be measured, like getting new email subscribers, boosting the number of website visitors or building a closer relationship with your audience etc. This will help to build your strategy to directly pursue the goal instead of going in circles. 2. Create a professional looking account. Remember - Instagram is all about the visuals, so make sure your store image is clearly reflected in your profile - an interesting bio and an awesome picture should be well thought-of. Also, think about the only link you are allowed to insert to take you closer to your goal. Starbucks account. Just being beatiful. 3. Research your target audience. To appeal to your potential followers, you’ve got to share the content they not only want to see, but also would be compelled to share, thus driving new Instagram users into your direction. So, ramble over your competitors’ accounts to see who is following them and create a profile of your typical follower - make it as detailed as you can and always refer to it later on, before making a new post. 4. Start posting frequently. Unlike blog posts, that require much time to prepare, Instagram posts come out much more often - even 10 times a day is ok, but if that is too much for you, 3-5 posts a day sounds good too. However, they shouldn’t be posted in bulks, but rather with a few hours’ interval (to keep your audience entertained, not bored with the flow of content from your account). Sticking to such a schedule may seem tough, but luckily there are helpful tools like CrowdFire that do the job for you. It would also be a good idea to bulk prepare posts in advance - there are a number of services for putting together images and catchy quotes to appeal to your followers. It’s a good idea to paste your logo on each image you post (make sure they are from credible sources). You can post some creative images of your products, but don’t do it too often, if you don’t want to turn your account into an advertisement. 5. Engage with your audience. Be always ready to communicate- respond to comments or comment other users’ posts, tag users in your posts, share their posts etc. Don’t neglect #hashtags - they make you easier to find. Also, you can create your own unique hashtag to get still closer to your followers. 6. Make them feel special. Your followers would be expecting certain perks from you, so make sure they receive these bonuses. Organise giveaways, provide special discounts, let them be the first to know about promos and new products - this will help to build trust with your existing fans and be an extra reason for them to share your posts with others. 7. Organise contests to enlarge your audience. This is not something new, but contests work to your benefit (if only they aren’t held too often). Typically they include tagging or sharing your posts and then choosing a winner who gets the previously announced prize. 8. Ask your followers to do what you want them to do. Go back to the goal you set at the beginning and invite your followers to act - subscribe for your newsletter, check out the product catalogue, etc. Don’t expect everyone to do it, but the result will be seen soon. This is just a “skeleton” of the way to improve your business progress using Instagram, but you will definitely work things out once you get started. Moreover, trying doesn’t hurt, and your time and effort investments will be rewarded with better knowledge of your audience and their deeper loyalty. So, why not get wants and needs met while using Instagram and driving the sales graph up? We will be happy to hear from you about your personal impressions and result for using this tool for business, so join in the discussion below. 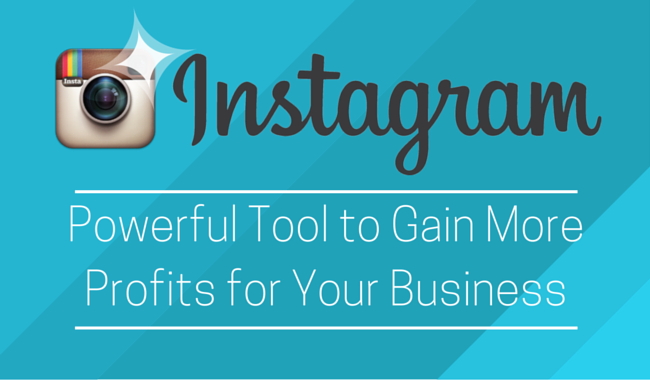 0 thoughts on "Instagram: Powerful Tool to Gain More Profits for Your Business"